On 26th of April, 2016 the Head and Father of the UGCC paid a pastoral visit to Dnipropetrovsk. There the Head of the Church together with bishop Stepan (Menyok), the exarch of Donetsk of the UGCC sanctified a CF “Caritas Donetsk” office and a cornerstone for building a church of St. Nicholas. Priests from the exarchate, employees of CF “Caritas Donetsk” and laity also participated in the Liturgy. 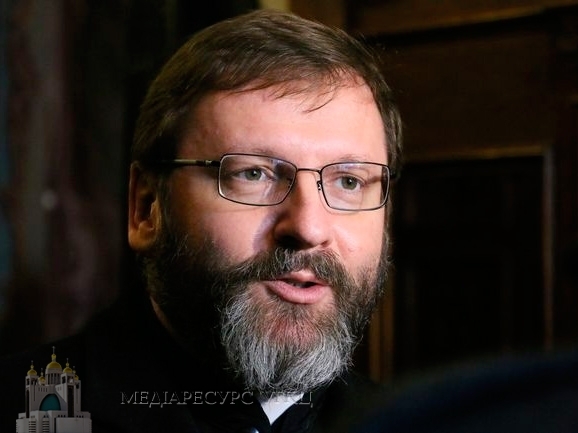 We briefly discussed with His Beatitude Sviatoslav the main aspects of his visit. You paid a visit to Dnipropetrovsk. According to the program CF “Caritas” office was sanctified as well as a cornerstone for building a church of St. Nicholas. Is this a whole program? In fact, it is just a part of my pastoral visit. However, it is very important, because we got a new social center of CF “Caritas” within Donetsk exarchate. Its structure in Donetsk was destroyed. Thus there was a need to shift this center out of an occupied territory to Dnipropetrovsk. With our partners’ assistance we could buy a piece of land and start building this office. This office will become a social service center of Donetsk exarchate and, particularly, a service for the citizens of Dnipropetrovsk. But we always point out that clerical service is different from humanities mission, performed by UN or other international organizations because of its Christian constituent. Since we serve people regardless their religious views, nationality and political beliefs. In every sufferer and needy we see a suffering Christ. And we serve our neighbor like we are called to serve and worship God. Such a social service is a part of our Church service. Obviously, two commandments about love: love the Lord your God with all your heart and with all your soul and with all your mind and with all your strength and love your neighbor as yourself – are coherent. Near this social center was started a building of a church what, in fact, is going to become a church over this complex. So this church is in honor of St Nicholas, Wonder-Worker, who is the brightest representative of implementing a commandment of God’s and Christian love. You had a meeting with the priests of Donetsk exarchate. What were you talking about? On my request was set a meeting with the priests of Donetsk exarchate which is the epicenter of military actions. The territory of the exarchate is divided into three parts: temporary occupied territory, “gray zone” where military actions are taking place, territory under the control of Ukraine. There were four priests who run their services on the occupied territory (from Lugansk and Donetsk). The meeting was held to revise our pastoral strategy in the exarchate. First of all, to modernize it considering new circumstances (serving refugees), boost the exarchate strength for the sake of cooperation with Apostolic City humanities mission for what on 24th of April was collected money to help suffering people in Ukraine, initiated by Pope Francis. We were trying to understand in what way our Church structures, particularly, on the territory where military actions are taking place must be open to become instruments for conducting this humanities mission of Pope Francis. Because extreme circumstances call for extreme solutions. Thus we are trying to understand how structurally and methodically we have to act today, so this pope’s assistance reaches every addressee. Our priests are ready to follow this task of Pope. Besides, we want to mobilize to this project both, priests and laity. In order to promote success of it, we are ready to mobilize our clergy from other dioceses. Likewise, it happened to our chaplains: was formed an inner mobilization so to help militaries at the front. And today we are ready to form this inner mobilization to serve those who suffered from war. So I met with fifty priests to work out a new tactics of our pastoral mission. In Dnipropetrovsk functions a parish of the UGCC. Was there an opportunity to meet with our faithful? I visited a local community of Intercession of the Most Holy Virgin Mary in Dnipropetrovsk. I was impressed how numerously this community has gathered as it was a working day and nearly 300 people were present. There was an interesting experience of sharing opinions. As far as I have noticed an average age of our parishioners is 35-40 years. They are Ukrainian Christian-patriots who came to this meeting with their children despite there was no festive service, as it were the days of the Great Week. The meeting was a paschal gift for me what I would never forget. And what is a government reaction on a presence of the UGCC in the city? I met with the representatives from the local authority. With a head of the city we discussed the importance of building a new church. A society gave an individual petition for a lot to build a church of St. Sophia. He promised to listen to this need. The mayor pointed out that his priority is a tolerance toward all confessions. He asserted that we have a right to develop and freely proclaim our faith. The head of the city signified that we are very important community in a sphere of social service for needy and wounded ones. City is a big center of a medical treatment of military men. I also met chief depute of regional state administration and group of people who are responsible for the social service. We discussed a cooperation between the organs of the state government and pope’s humanities project that is being prepared. They showed readiness to cooperate. So, I think success of Caritas mission depends on such cooperation.